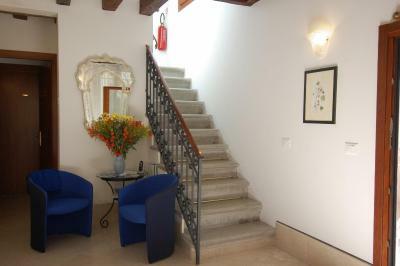 Lock in a great price for Santa Margherita Guest House – rated 9 by recent guests! Everything about staying here was amazing! Definitely recommend it. Loved the location! Very clean great place to stay!! Owner made sure there were some gluten free snacks in our room and cereal downstairs. Very clean. Very close to vaporetto without crossing bridge. Very happy with stay! Thank you Maria! The hostess Maria was exceptionally helpful with directions, travel tips, etc. We received a nice welcome gift. 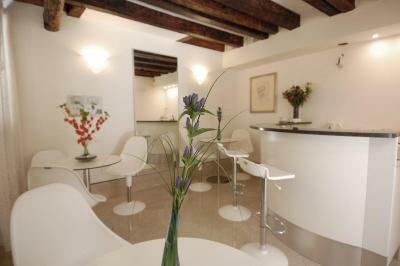 This guest house is located in a truly wonderful part of Venice – really close to Campo Santa Margherita, which is a lively residential and student neighborhood, well off the beaten path of San Marco or the Rialto. But it's still a close walk to the Accademia and all that Venice has to offer. 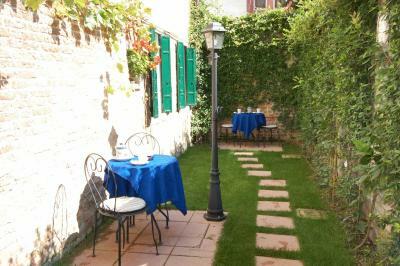 This was a wonderful guesthouse away from the hustle and bustle of Venice, but not too far away that places cannot be easily reached! The bed was comfortable, the environment felt very private and secluded, and the breakfast was far more expansive than I had expected! Chocolates and water in the room and juice/drinks in the kitchen whenever you wanted were a lovely added touch. A very nice, typical Italian breakfast with an assortment of fresh things. The location has less tourist stuff around so it is quieter and less crowded. 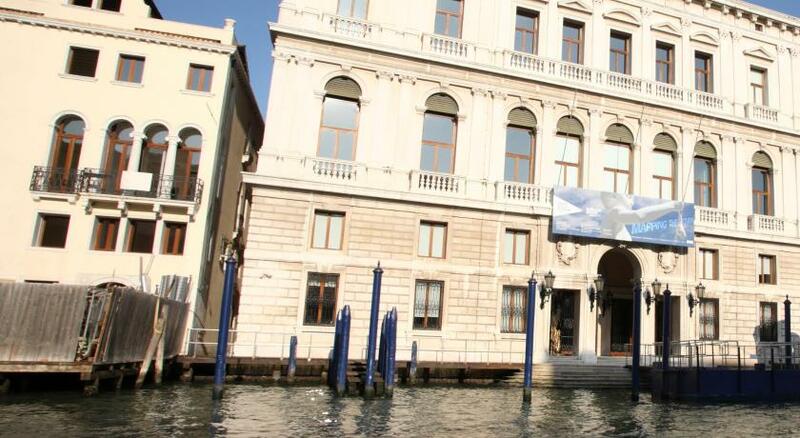 A very easy close walk to activities and the vaporetto (water buses). Also an easy walk to train station. Location central to the island with good access to primary sites. 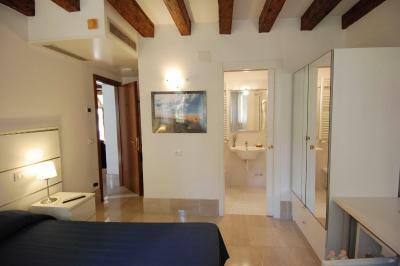 Room was good, very clean and the staff were very helpful. Breakfast selection was very good. 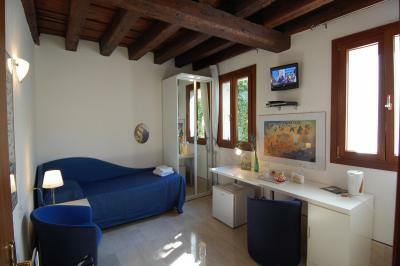 Santa Margherita Guest House offers bright, air-conditioned rooms with flat-screen TV. Located in the lively area of Campo Santa Margherita, St. Mark's Square is a 15-minute walk away. Rooms at the Guest House Santa Margherita have a modern design and are equipped with an electric teakettle and DVD player. Breakfast is served on the grounds in the summer months. A free communal kitchenette is available for simple meals. 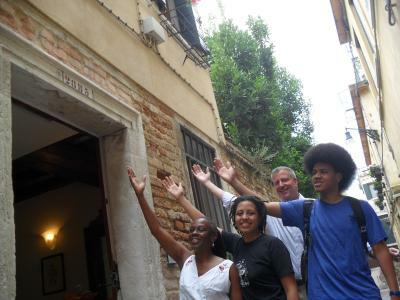 The guesthouse is well located for Venice's tourist sites including the Peggy Guggenheim Museum just a 10-minute walk away. Santa Lucia Train Station is 1,650 feet away for service to Venice Marco Polo Airport. 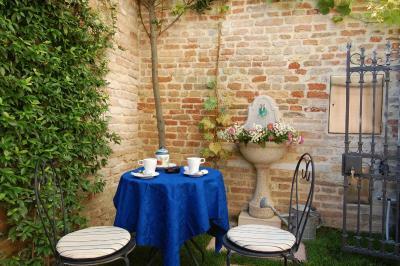 When would you like to stay at Santa Margherita Guest House? 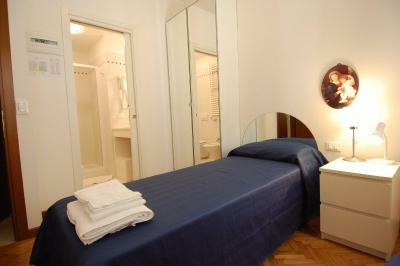 This air-conditioned room features a fridge, electric kettle and private bathroom with free toiletries and a hairdryer. House Rules Santa Margherita Guest House takes special requests – add in the next step! Santa Margherita Guest House accepts these cards and reserves the right to temporarily hold an amount prior to arrival. 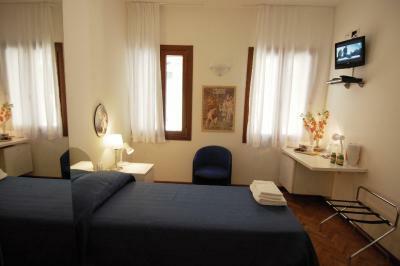 After booking, you will receive a door code and check-in information from Santa Margherita Guest House via email. Please let the property know your expected arrival time in advance. You can use the Special Requests box when booking or contact the property. Charges may apply for late check-in. Please note full payment is due at check-in. The city tax is payable in cash only. Please note that there is no reception or left luggage service. A clean and well located guest house in Venice. Not the most comfortable bed but ok. Superb little place to stay in a great location. Really well looked after without any fuss. Would definitely recommend and would stay here if we visit Venice again. Nothing I can think of. location is a bit far from the station and taxi point. But it's venice, didn't mind walking. - it's not very hygienic to use a single sheet and the blanket on top (blankets are probably not washed after each guest), a double/envelope sheet is a must to fully cover the blankets. - breakfast was not so good for us, did not try it again in the second morning. I read that the law requires pre-packaged food only, but still, better choices could have been made. Or maybe no breakfast at all and decrease a bit the price. ;) - more shower gel in the rooms would be a plus, was only enough for one shower and we spent 2 nights. - very cold floors, some small carpets could be useful in the rooms at ground level. - some darker colored drapes would very much help guests sleep more if they prefer, instead of the white ones. :) - double bed is actually 2 single bed mattresses put together. 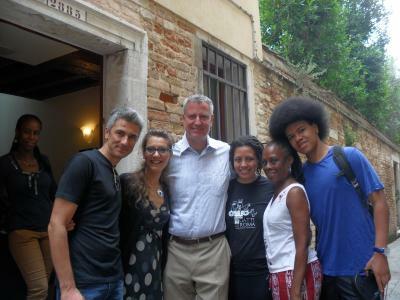 - location is AMAZING, loved the neighborhood. 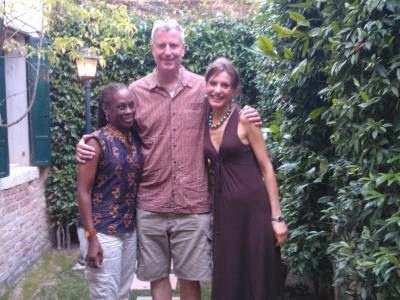 - very nice hosts, we've corresponded only via email but everything was perfect. Very nice guest house. Clean, comfortable room, friendly staff, good breakfast. 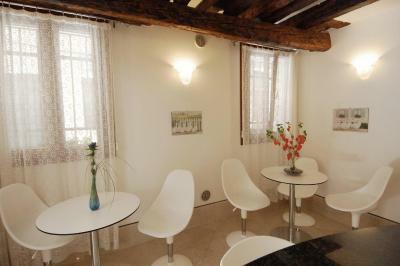 Excellent location near Campo San Margherita. Warmly recommended. 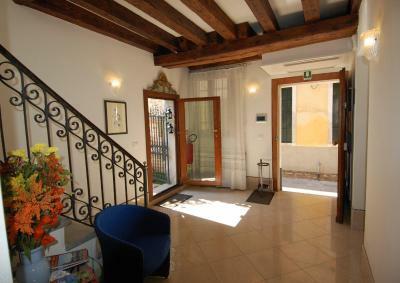 Fantastic location right in one of my favourite Venice neighbourhood. Price-quality it's a great place and I recommend it. However, few things could be improved.. e.g. the top bed cover (not the white blanket, the colourful cover) needs washing; the hair-dryer is old and slow. Efficient and smooth communication with the owner. Although there is no front desk, for us it was not a problem at all! The information provided by email/ letters was clear and precise. She seemed to be very nice person. I mentioned that I am lactoses intolerant and she bought me lactoses-free yogurt, butter and milk!!!! Very much appreciated!! (overall, the breakfast is quite basic..) We loved the location!! After exploring well Venice (first time visit) we decided that the area we stayed at was our favourite one for staying, because you could feel it a bit more local, I mean Italians living there, a bit less overcrowded/ touristy, also, some good restaurant nearby and an amazing bakery del nono (great coffee and pastries)! I think price-quality it's a great place! Clean and warm and fully equipped. There was anything we didn’t like. Lovely place, very comfortable. Staff are fantastic. Very welcoming. My room was right by the entrance on ground floor and people going in and out kept me awake. Neither did the fridge work. Very friendly and helpful staff even though they were mostly not on site. 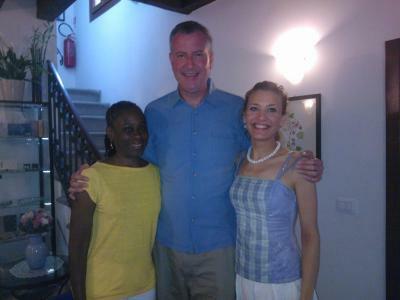 They provided me with gluten free food and snacks which was very kind. We weren't able to sit out in the very nice garden because of improvement work being carried out, but I'm sure this will be of benefit to future guests! Quiet location, comfortable facilities. The breakfast was fine. The owner, Maria, was most helpful, giving us clear directions on how to get to the property and quickly and efficiently answering emails.